PSO believes that all accidents/ incidents are preventable and our first aim is excellence in HSE standards in all PSO businesses. In order to ensure “Zero incident” at PSO CNG stations, knowledge pertaining to the safety and technical aspects of CNG business is obligatory. In continuation with the vision to promote safety procedures and practices, PSO has been engaged in organizing CNG technical training seminars for all its Divisional Engineers, PSO CNG operators/Technicians and Station owners on countrywide basis since almost last five years. Pakistan State Oil has always considered safety as investment. We believe that for a business to be successful in the long term it has to create value, not only for its shareholders but also for its business partners. We call this ‘Creating Shared Value’. It is not philanthropy or an add-on, but a fundamental part of our business strategy. 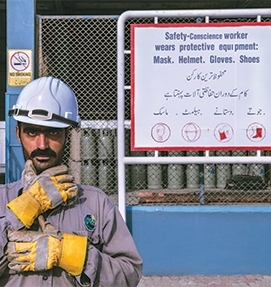 In order to impart awareness related to the safe handling of LPG at PSO plants and at distributor’s premises, we organize HSE days at PSO LPG Plants at Korangi, Lahore, Akora Khattak and Dhurnal each year. Our plant’s staff, distributors and distributor’s staff of respective region/area participate in HSE days at our LPG plants. HSE induction, comprehensive lecture on the importance of HSE, HSE behavioral safety videos and presentation on LPG cylinder safety are the main highlights of these HSE days. At the end of HSE day, fire drill is also conducted at each plant.